Talk about a true original - our Tart Cherry Fig Figgy Pops are the supersnack that started it all. Well, actually, nature started it all (we best give credit where it’s due). 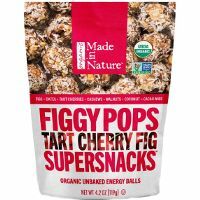 From tart cherries, figs and dates to walnuts, cashews and a coconut coating so official it should be notarized, these bites are fit to feed the likes of superheroes, and that means you.